My lawyer advised I don’t go into specifics, but lets just say that plant tragedy has struck this household on more than one occasion. Exhibit B- may they rest in peace. Yeah, that’s the plant graveyard on my back porch. But here’s my excuse, see? The weather is crazy stupid here. 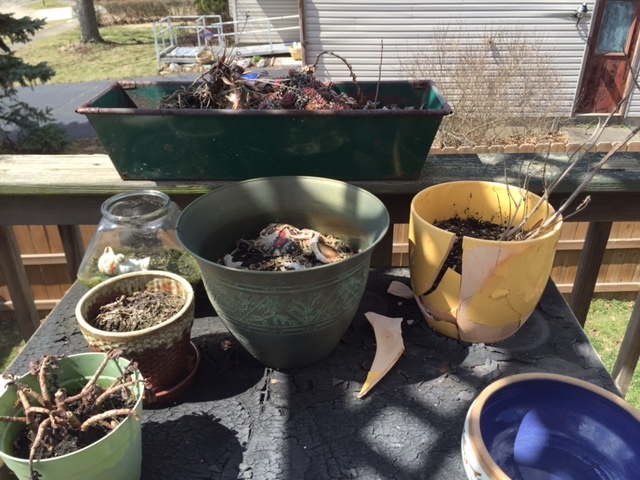 It was summer one second–my plants were outside on the deck, growing wildly in the Ohio sunshine. It was a beautiful thing. And then next day it snowed and everything died. The end. Okay, but it’s not the end. Because at Wal-mart that day, I bought plants. I bought little plants and medium plants (but no big plants because we don’t come from “big-plant money.” We are just middle-plant/small-plant money folks.) Then, while walking through the produce aisle, I spotted an end-cap of growing herbs. I LOVE herbs! I just hate paying for herbs… This seemed like a great compromise. I would buy the growing little pot of basil, I’d have basil to use more than once AND it would continue to grow so I would have more basil in the future. It was FOOLPROOF, I tell you! FOOLPROOF. And then it died. The end. No, not the end because I’m mad! I never even used my little basil plant! I re-potted the little thing into this weird wineglass thing I got at the thrift store. Is that why it died? Was that the wine glass someone used to drink poison? 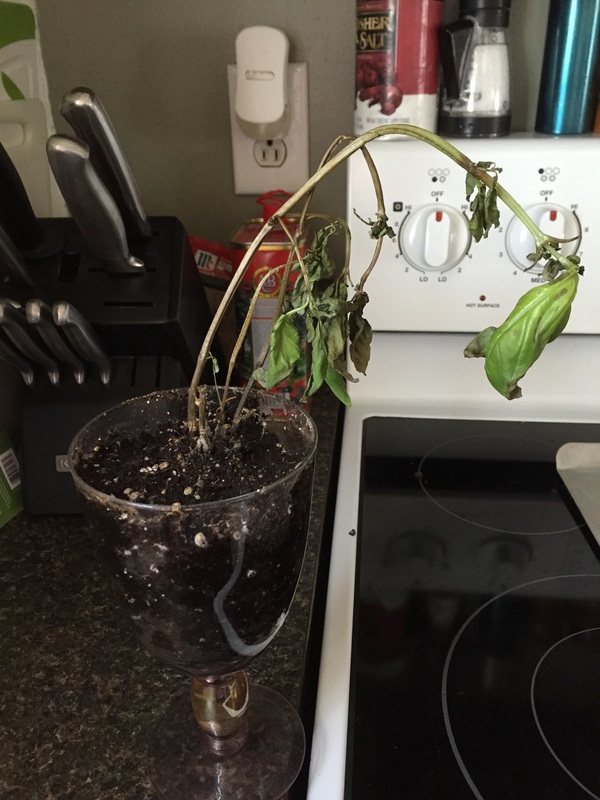 Was there residual arsenic in the glass from some schmuck committing suicide and it ended up killing my plant? Oh my poor plant! That’s what must have happened! It could not have possibly been anything I did in the least! Yay! Nothing is my fault, just like always! Yay! So as long as I don’t leave my darlings outside and don’t put them in ugly poison glasses, they should be fine! I feel like I have life figured out now and nothing will ever go wrong again!